4Videosoft 3D Converter allows you to convert 3D movies to 3D movies and popular video formats like MP4, AVI, FLV, MOV and more. It allows you finish your conversion within several clicks and this would not damage the source videos quality. 4Videosoft 3D Converter is the professional program to convert 3D movies. It can help you convert common videos and 3D movies to 3D movies. And you can also convert 3D movies to 2D movie. This powerful 3D Converter enables you to easily enjoy 3D movies with your 3D TV or other compatible devices. You are allowed to optimize the video with the versatile editing functions. 4Videosoft 3D Converter is the best 3D Converter for you to convert 3D movies as you like. You are allowed to convert general videos to 3D videos. It is very easy to convert 3D movies to 3D movies. You are able to enjoy the output video on your 3D TV or compatible 3D devices. What’s more, it can help you convert 3D movies to ordinary videos like MP4, MOV, AVI, FLV, WMV and more. You can enjoy them on your portable devices such as Samsung Galaxy S4, Samsung Galaxy Note 3, iPhone 5S/5C, iPhone 5, iPad Air, iPad mini 2, iPod touch, etc. 4Videosoft 3D Converter provides you with powerful editing functions to edit your videos. It allows you to save the output 3D movies as three output settings like Anaglyph (ten types), Side by Side (Half-width/Full) and Top and Bottom (Half-Height/Full). You are able to reset the profile settings as you like. For example, you can modify video settings by adjusting Encoder, Frame Rate, Resolution, Aspect Ratio, Video Bitrate and Zoom Mode as well as Audio settings like Encoder, Sample Rate, Channels and Audio Bitrate. If there are several audio tracks and subtitles in your original video, you are able to choose your favorite one. 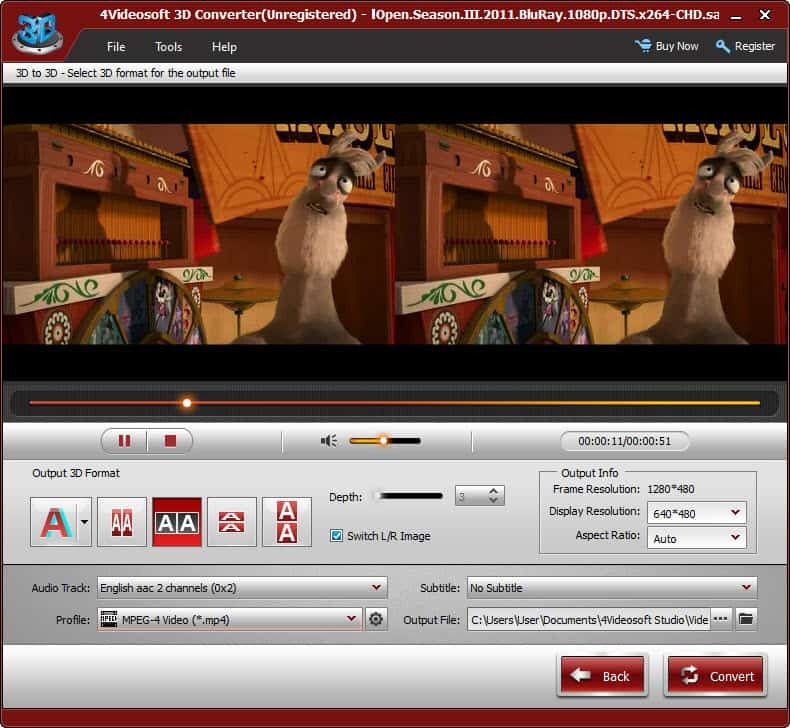 4Videosoft 3D Converter enables you to preview the source videos. And it provides you with the powerful NVIDIA and AMD tech to have acceleration. You can finish your conversion within several clicks.